Today we have been in the garden again. The kids can’t get enough of being outdoors at the moment. Its not like we never went out in the cold months, because we did. But I have to admit the sun does make it more likely! My kids are definitely outdoors kids. The more they can play outside the better. They love running. They love digging. They love bugs (we found some huge worms today!). But I think most of all they love water and we have done a lot of water play since the warm weather has arrived. 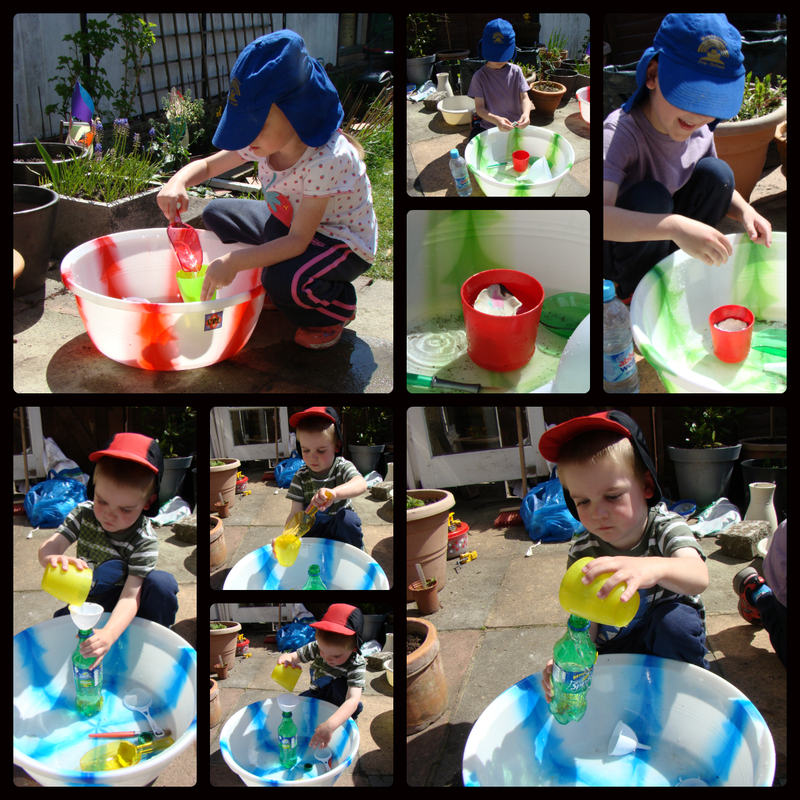 So today we started the day with … water play! I got some large bowls from a local shop recently and I used these this morning. I filled them about a third full and left a selection of bottles, beakers, scoops and funnels nearby. The kids also found some paintbrushes and sieves that they wanted to use. They spent a long time pouring and scooping water from one vessel to another, especially Ben. Ben loves pouring and will sit and do this for ages! Jasmine and Thomas did some water drawing on the patio using the paintbrushes, and Jasmine “cleaned” some plant pots! After a while Thomas asked if he could make a boat so I suggested plasticine, and he spent a long time making floating and sinking plasticine boats. After lunch I had set up the Tuff Spot with “messy pudding.” I got the idea from Caterpillar Tales, but instead of doing Angel Delight I thought I’d put in all the ingredients of trifle! I used jelly, custard, dream topping, rainbow sprinkles, frozen raspberries and I also added some Rainbow Drops (sugar coated puffed rice sweets) for added texture. I did also buy a sponge cake to slice up and put in, but then forgot about it so it is still in the cupboard.. oops! I told the kids that “messy pudding” was in the garden. I was very careful not to say the word “trifle” because I wanted to see what they did with the ingredients. Well, the first thing Thomas said was “ooo, trifle”.. typical! 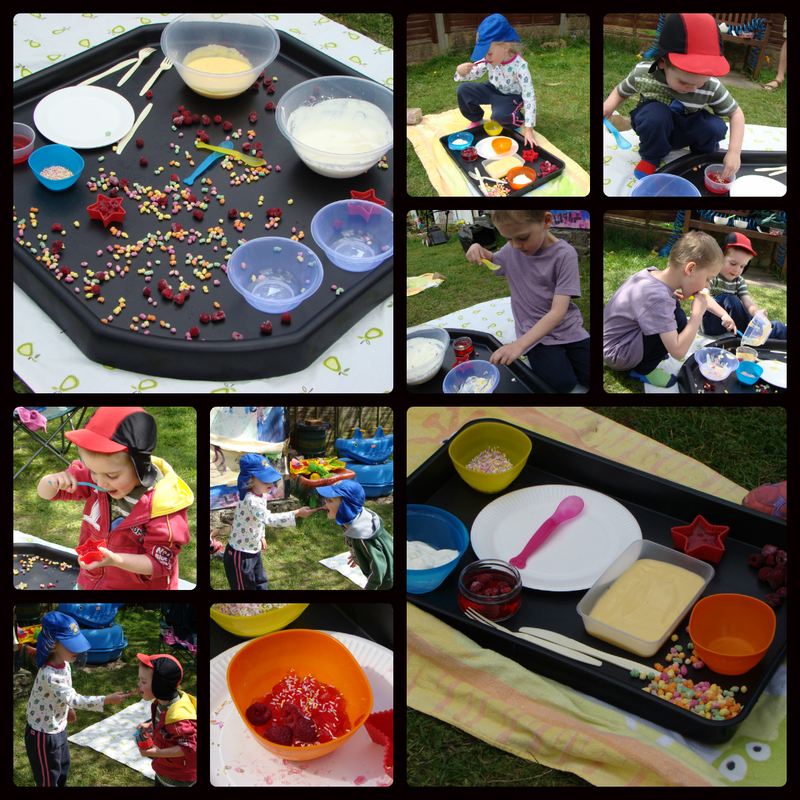 They all enjoyed eating the food and mixing different ingredients together. They made Raspberry Pie, Custard Sprinkes and Jelly Sprinkles. Jasmine ate a little of each ingredient separately but then started mixing things together and feeding the boys! Ben ate a lot of jelly and raspberries, but not much of anything else. Thomas made several versions of trifle with a bit of everything in! I was quite surprised by how clean they all were with the food though. Once they had eaten enough they didn’t want to do anything else with it. I suggested that they could tip the food onto the Tuff Spot, or make pictures with the Rainbow Drops but they didn’t want to. They seemed to enjoy eating pudding that way though so I think we will try it again. After we’d cleared the food away I put some more water in the large bowls and some in the Tuff Spot and the kids spent a bit of time playing with water again and riding their bikes while I did some more planting and Gordon did some more work on the pond and started building a “mud kitchen” for the kids. 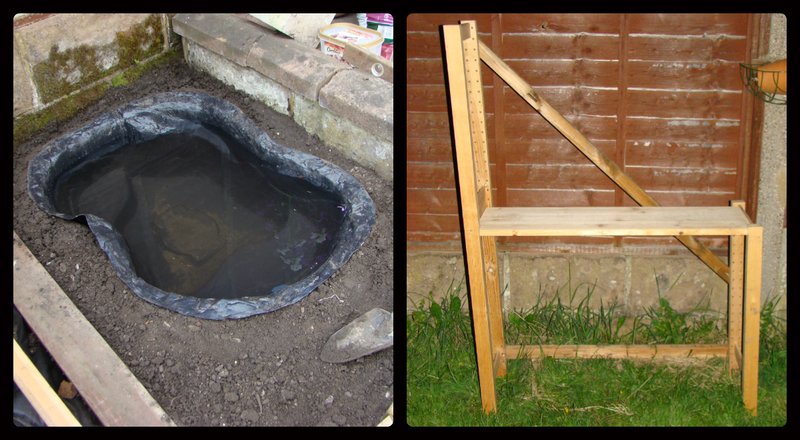 I have been thinking about making an area in the garden where the kids can dig and make mud pies, and have even bought a few things for this recently in the hope that I can actually make it happen. Then out of the blue today Jasmine started talking about wanting to mix mud and water, and Gordon remembered he had some suitable wood in the garage. So our mud kitchen was born! We are going to add a trellis along the back and side for hanging pans and utensils on, but hopefully it should be finished by the end of the week. I think the kids will love it!